We are sometimes asked by our supporters where their funds go and who benefits when they donate to CUESA. In this season of giving, we’ve decided to answer this important question by profiling four recipients of your donations and CUESA’s work. Last week, we shared the story of a family that has made their farm more sustainable. 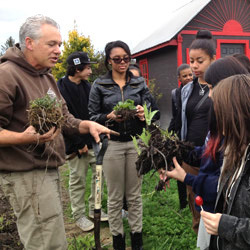 This week, we meet a high school student who has found a new path through CUESA’s Schoolyard to Market program, which is made possible with help from supporters like you. 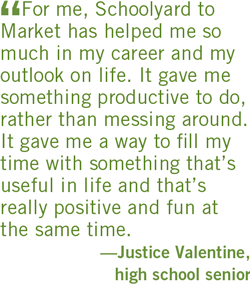 Justice Valentine is a bright 17-year-old senior at Life Learning Academy, a San Francisco Unified School District charter high school serving youth who have been involved in the juvenile justice system or who have faced other life challenges. 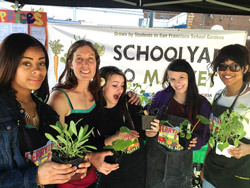 Justice participated in Schoolyard to Market, a gardening and youth entrepreneurship program run by CUESA through her school, in spring of 2012 and again in the fall, because she enjoyed it so much. She learned how to grow vegetables and herbs, how to cook with them, and how sell them at the Ferry Plaza Farmers Market. 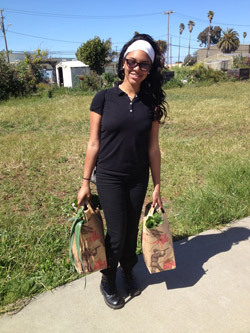 After participating in the program, she landed an internship as a market representative for Yerena Farms. “It was a good experience,” says Poli Yerena. “She is making an effort to succeed in life, and I noticed.” She now interns at Juicey Lucy, an organic juice maker in the city. Through these school and work experiences, she has discovered a healthier way of living, a career goal, and new confidence in herself. When she started breaking down the different plants and vegetables and everything, I really got into it. I started thinking, “Where does my food come from?” When I learned where the food I was eating was coming from and what processes it went through, I was like, “Ew!” I wanted to eat healthier. Then, our teacher started talking about bringing our garden produce to the farmers market. I wasn’t really a people person at first, but I got used to it. I just loved the feeling of really knowing what I was talking about and sharing my knowledge with others. Being out there with all those people was really, really good. After doing the program for two semesters, I talked to LLA’s internship director and explained how I was a people person now and I really like the market, and he sent me to Poli at Yerena Farms. My first market was at the Civic Center, and we were selling strawberries. When I got there, I basically used all of my skills and stuff that I had learned from Schoolyard to Market. I really impressed him, and he was like, “Whoa, you know what you’re doing!” And I said, “Yes, my teacher taught me.” It was pretty cool. My eating habits have changed drastically, being introduced to fresh food and the whole organic thing. Eating well does so much for the body—not just organic, but healthy food in general. I know that I’ve got more energy now and can concentrate better than before. I want to be a nurse practitioner now. I don’t think you need a prescription for everything. Changing your eating habits can help cure a lot of stuff. One thing I would say to future Schoolyard to Market students is that it’s not all easy. You have to be open and willing to try everything. It’s a learning process, and with hard work and determination, you can learn a lot from it. For me, Schoolyard to Market has helped me so much in my career and my outlook on life. It gave me something productive to do, rather than messing around. It gave me a way to fill my time with something that’s useful in life and that’s really positive and fun at the same time. A gift to CUESA means that students like Justice have the opportunity to learn more about our food system, eat healthier, and gain critical job skills. Please make a tax-deductible donation today. Bottom three photos by Karuna Schweig, Life Learning Academy.